Only 2.3 miles to Westhampton and a 10-minute drive to one of the most beautiful beaches in the world. Also 10 minutes from Gabreski Airport- location of complimentary parking and shuttle service to US Open. This unique country cottage is situated right on the water on a private boat basin filled with Swans and other salt and fresh water shore birds. An open plan design, this approx. 2000 square foot cottage with two bedrooms, a TV room library, and a living, dining area and open kitchen is perfect for easy living at the shore. The house has large five-foot glass sliding doors facing the water from each of the three main areas—the living dining kitchen area, and the two bedrooms. Each bedroom has a super deluxe queen size bed. Each has a view of the water and one has its own fireplace. For kids we have a Pack n Play and a children's cot with linens. There's a booster seat, plenty of toys and a large backyard for games and fun. 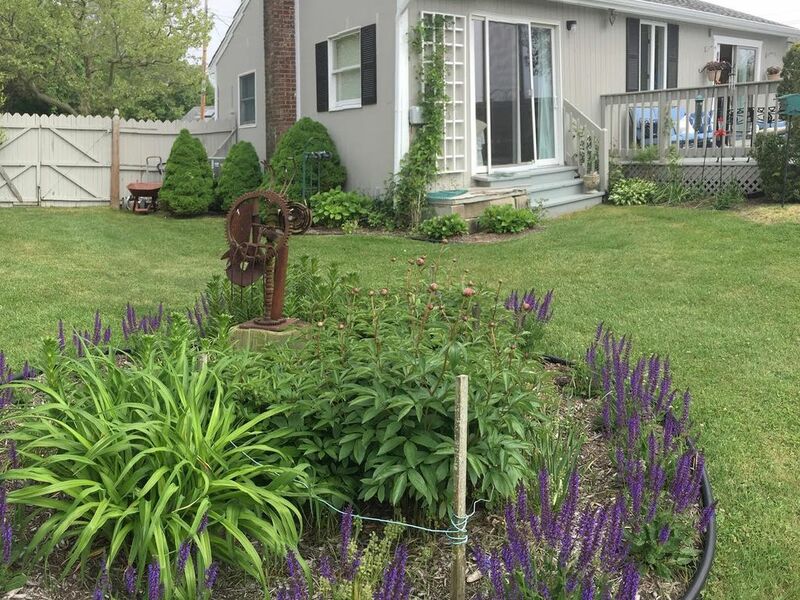 The private backyard garden on the water is planted with fragrant blooming flowers designed to attract the bird and the butterflies and to have something in bloom all summer and fall. A six-foot solid wood fence provides privacy. With a hammock, a lawn swing, and down on the bulkhead looking out to Moriches Bay, there are two full length outdoor Brown Jorden lounge chairs. The bulk head and the floating dock are great for fishing in your own back yard or at high tide swimming at your own risk. Inside you have Wi-Fi, cable VCR/DVR player and HD TV in your own library /TV game room with a desk for your laptop. There is a washer/ dryer, icemaker, dishwasher and all the comforts of home. Each bedroom has its own dresser and the master has its own closet. Two more closets are available. One in the TV room and a hall closet by the front door. An open plan design, the second bedroom has its own fireplace and the large five-foot door opens onto the living room/ dining area and kitchen during the day to create a large, light airy open space. Both rooms in addition to the sliders and windows have sky lights to make for a bright cheerful environment all day long. The floors are wood each with a sisal colored carpet designed for easy summer living. Both bedrooms have sliding doors with screens that open onto the deck and garden if you want to be lulled to sleep with the sounds of the great outdoors. Or you can use the central AC which keeps the house at the perfect temperature. Situated in a quiet area, you can escape from the roar of traffic and hectic pace of the city in the beautiful garden, feed the swans, or grab your sun cream and head to . Some of the most beautiful beaches in the world are just minutes away. But get up early to get a parking place. Lashley Beach (385 Dune Road) is less than 6 miles away. Or try Cupsoque County Park with its drop dead beach, Beach Hut restaurant, and 269 acres on the ocean, Moriches Bay less than ten miles away. ($18 parking fee). Early birds can get one of the free parking places on the bridge by Rogers Beach in Westhampton. The house has plenty of beach towels, beach toys, beach chairs, and a beach umbrella. Too lazy to drive, just walk one block to the beach at end of Rogers lane to watch the sunset over Moriches Bay. It’s a magic walk at night too. Reach up and touch the stars. Remsenburg, a carefully guarded secret, is the un-Hampton Hampton. Main street a few blocks walk or bike ride from Swan Cottage looks like a Vermont Village with white clapboard houses and picket fences with flowers blooming over the rails. Just an hour and fifteen minutes from NY, you step back into another world--the way the Hamptons used to be 30 years ago. The only commercial structure in this hamlet is the two-room post office. Yet it is just two miles away from “ happen’n” Westhampton Beach with its restaurants, boutique shops, Westhampton Performing Arts Center, movies, Farmers Market on Saturday and some of the most famous beaches in the world. Wine tastings at the Vineyards on the North Fork are not far away. Not feeling beachy head to the Aquarium in Riverhead, Splish Splash water park and the Great Safari park for the kids. Dogs allowed with special considerations and cleaning fee. Fall asleep looking at the water, wake up to the birds. Spend the day at the beach and have dinner on the back deck. Boat access, bay views, beautiful garden. five miles from the shuttle to the US OPEN golf tournament.